13.2% alc., $25. Made from original plantings of Wädenswil (1985) and more recently planted Pommard, 115 and 777. The estate vineyard is dry farmed and lovingly nurtured by Dan and Nancy Chapel. · Dark-fruited, brambly, herbal nose with hints of Moroccan spice and roasted nuts. Dark and brooding, with rich, showy and mouth filling dark red cherries and raspberries leading to a dry finish. Impressive extraction and ripeness for the 2007 vintage. Still has some tannins to shed and will benefit from another 6 months in bottle. A great value. 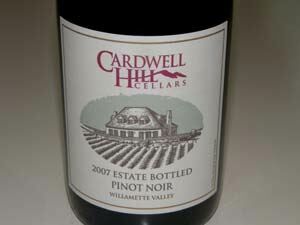 Note: Cardwell Hill Cellars is located in Philomath, just west of Corvallis. The Chapels poured their 2006 vintage, now sold out, at last year’s International Pinot Noir Celebration. The Chapels also happen to be my neighbors and live a block away. They split their time between Orange County and Philomath, not an easy task. Read more from a previous issue (www.princeofpinot.com/article/176/). 14.0% alc., 73 cases, $55. · The aromas recall an exotic perfume exhibiting wild dark red fruits and spring bouquet. The wine is powerfully flavored yet retains the delicacy and velvety texture that is so sensual in Pinot Noir. Multilayered flavors of red plums, ripe berries, currants, spice and a little earthiness. Perfect integration of t n‘ a. There is something magical about this vineyard. 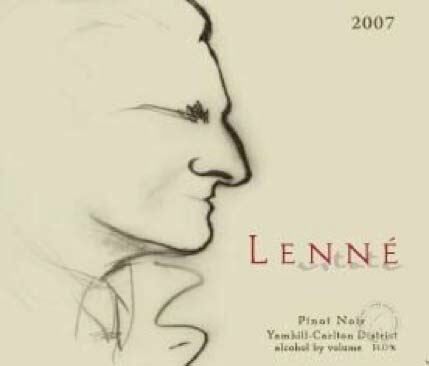 Note: Lenné Estate was reviewed in Volume 7, Issue 15 (www.princeofpinot.com/article/648/). The wines are sold through a mailing list and on the website at www.leneeestate.com. The 2007 lineup of Pinot Noirs were very impressive.